The Futureheads are set to finish 2005 off with a new 3 track E.P. called 'Area'. The 'Area' EP is out on November 28. The title track is already a live favourite, and it's backed by 'Help Us Out', sung by guitarist Ross Millard, and 'We Cannot Lose', where vocals are handled by bassist Jaff. 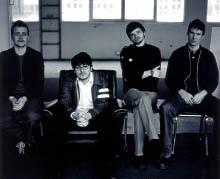 The EP, recorded in September in London and Newcastle, is a stand-alone release for the band as they begin work on their second album due for release in mid 2006.